Spam may be the brunt of many jokes, but this canned ham product is deeply rooted in American history and has earned a large dedicated following. Over its 70-year history, Spam has gone from being just another luncheon meat to becoming a pop-culture icon. The Hormel Company created spam in 1937 and was a favorite during World War II. Not only was Spam highly consumed in the states when other meats were heavily rationed, but it was also a popular item for the troops abroad thanks to its stability and easy shipping. Today, Spam is particularly popular in Hawaii, which has the highest spam consumption per capita, as well as the United Kingdom, and parts of Asia. Spam is currently sold in 41 countries throughout the world. The ingredients listed on classic Spam include pork with ham, salt, water, modified potato starch, sugar, and sodium nitrite. Potato starch is used for binding the chopped meat together, and sodium nitrate is used as a preservative. Natural gelatins cause the jelly-like substance that surrounds spam in the meat that solidifies when cooled (like an aspic). Depending on the variety of Spam, other ingredients, including chicken or turkey, may be added. There are numerous different flavors of spam. There is a low sodium variety of spam for those who are looking for a healthier option. Spam can be baked, fried, grilled, or eaten cold straight from the can. Since it is precooked, heating is optional. One of the most basic ways to serve spam is pan-fried alongside eggs for breakfast. Spam is so versatile it can be used in anything from burgers to sushi. Spam eaters are known for their creative uses of the canned meat. Spam isn't the most nutritious meat you can choose because it's high in saturated fat and preservatives, but if you're going camping it can make a great cooler free protein. Every year in the Hawaiian town of Waikiki, the annual Spam Jam is held the last week of April. The festivals great food and family friendly atmosphere is quickly making it one of the most popular festivals in the state. 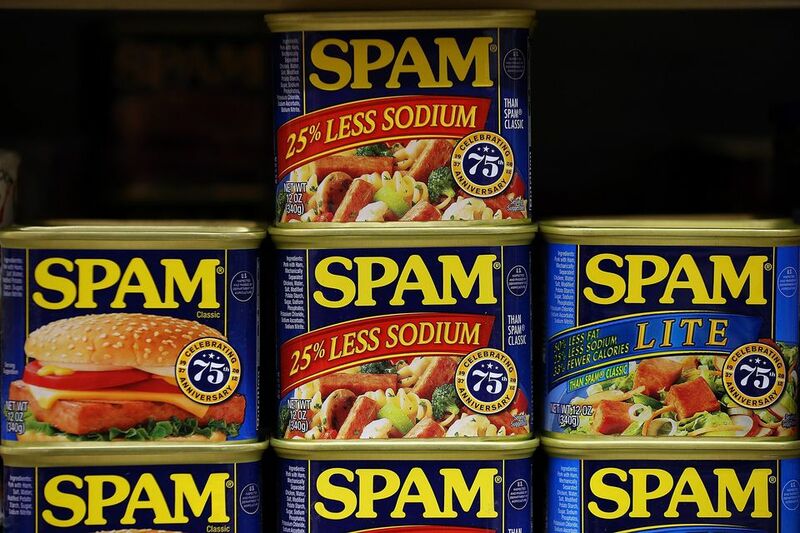 Hawaii consumes almost seven million cans of spam per year. Austin, Minnesota home of the Spam museum, also has an annual Spam Jam. The Hormel company is located in Austin. The small town of Shady Cove, Oregon, has an annual Spam Parade as well. Spam has been a part of American culture since World War II when its use in the war, not only as food for soldiers but also for gun grease, caused some to refer to Uncle Sam as Uncle Spam. When the war ended Hormell assembled a music group made up of ex-servicewomen called the Hormell Girls. Their job was to entertain and promote patriotism and spam, but perhaps the most well-known example of spam in pop culture is the song of the same name by the comedy troupe Monty Python.